The strongest Haki was introduced in One Piece so far has been the Conqueror's Haki, one which only certain strong individuals have been endowed with. 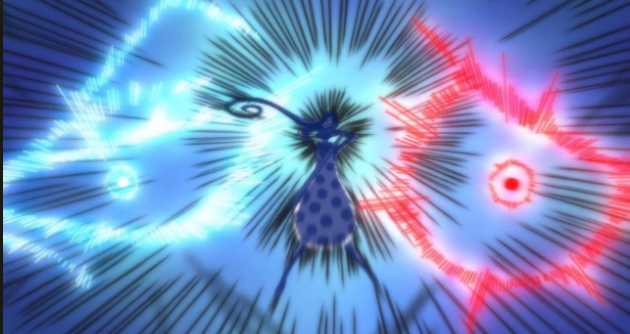 So it becomes increasingly rare to get two full unleashes of it at the same time which happens in the latest episode of the series, however, as Luffy and Katakuri clear out the Mirro-World with a fully unleashed Conqueror's Haki clash. In the Episode 868 of the series, Luffy and Katakuri's battle takes on an honorable new meaning that Luffy has earned Katakuri's respect as a fighter which even going so far as to injure himself after one of his sister Flampe's needles helped to heavily wound Luffy earlier. Fully revealing his mouth, his sister and her underlings made a lot of noise about revealing his secret to the rest of the family and Katakuri and Luffy pay them no mind. Katakuri says that the people on the sidelines are annoying where Luffy, understanding what Katakuri wants to do responds, "They can't stand on their feet anyway!" Then the two of them unleash their Conqueror's Haki and the auras clash in mid-air. This battle destroys much of the Mirro-World, and completely knocks out Flampe and her goons.